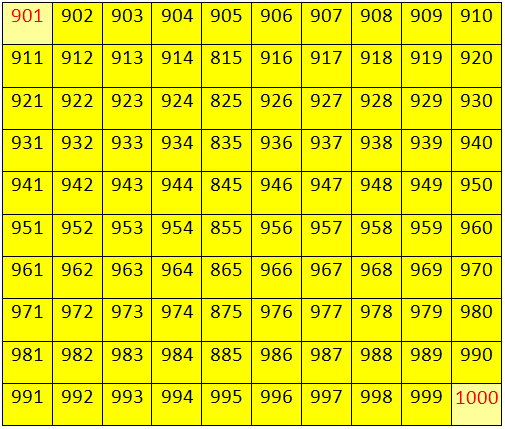 Worksheet on numbers from 900 to 999 will help us to practice the numbers from 900 to 999 in orders. 1. Fill in the missing numbers. (i) Count by twos from 950 to 970. 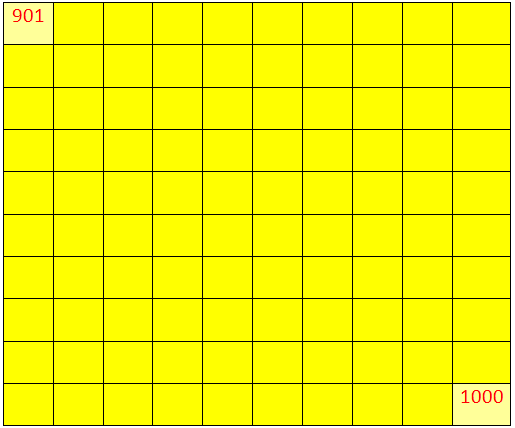 (ii) Count by threes from 961 to 989. (iii) Count by fives from 925 to 950. (iv) Count by tens from 920 to 960. (v) From 933 take away 918 and multiply the answer by 6. (vi) From 970 take away 953 and multiply the answer by 4. (vii) From 987 take away the sum of 110 and 75. (viii) From 901 times 2 take away 969. (ix) Subtract 977 from 999, and multiply the difference by 2. (i) 913, 915, 917, ____, 921, ____, ____, ____. (iii) 980, 970, ____, ____, 940, ____, ____, ____. (iv) 959, 964, 969, 974, ____, ____, 989, ____. (v) 918, 938, 958, ____, ____. Answers for the worksheet on numbers from 900 to 999 are given below to check the exact answers. 3. (i) 950, 952, 954, 956, 958, 960, 962, 964, 966, 968 and 970. (ii) 961, 964, 967, 970, 973, 976, 979, 982, 985 and 988. (iv) 920, 930, 940, 950 and 960.